Diamine Blue Lightning | Inkdependence! This is an excellent blue ink. Perfectly sky blue with enough silver shimmer to show up without overwhelming the color. It's a good balance, I think. This is also an ink that performs really well in the nibs I've tried it in. Originally it was in a broad stub, but I've also got it in a medium nib right now and there haven't been any issues with it drying up in the feed or anything. 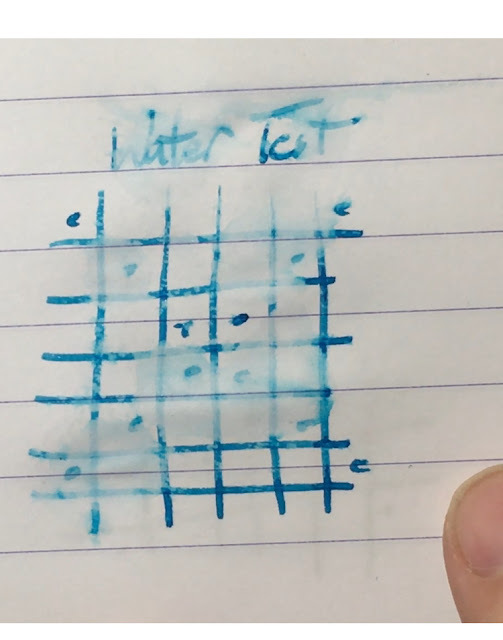 That's a common issue with these glittery inks, but I haven't seen it with Blue Lightning. So, when you're feeling fancy, ink this up and give your writing a subtle silver sparkle. Thanks, Brian and Lisa, for sending this one out for review! I have lots of pictures taken in different lighting, so I figured I'd include them all here. Above is indirect sunlight from a window, and below is sunlight on a cloudy day. These two were taken outside in the sun. These next two were taken inside with indirect sunlight. Dry time is actually pretty quick for this ink on Rhodia. It's nearly instant on copy paper. This one is really close to Franklin-Christoph's Spanish Blue, so if you're looking for this hue without any sparkles, then check out Spanish Blue. In the picture below you can just see the line of silver shimmer where the ink was laid down. While this ink seems to be consistently glittery, the glitter will come out of solution and fall to the bottom of the vessel. It looks right nice. Also: talk about sky blue, huh? Couldn't be more sky blue, now that I look at it. This is a pretty wide, wet nib so this is pretty solid performance. It's not perfect, but this is more like ghosting than bleed-through. I included two shots to let the glitter flash a bit. You can find this ink at Anderson Pens for $20 in a 50ml bottle or $1.50 for a 3ml sample. I think this one is probably worth a bottle, but there are so many inks in this collection that you may want a sample of each. Another fine review, Sir. I've only the "Night Sky" of the Diamine Shimmer line and like it a lot, but it has clogged in the pen I've used it in. It's encouraging to know that this attractive ink isn't prone to that. I'll have to give this one a try, though I need another bottle of ink like another hole in my head! Thanks Mike.